Welcome to Islay Cycles. I'm Jim, the owner of a cycle shop with a difference. Located on the Hebridean Isle of Islay we run a bike business alongside my practice as an artist. I use my bike to get around and to visit painting locations. The island does look different when you travel by bike. There is time to see the full panorama and catch the many beautiful light effects our atmosphere throws on the landscape. It's possible to spot a high flying eagle in the same breath as hearing a stone-chat on a roadside dry stone dyke. 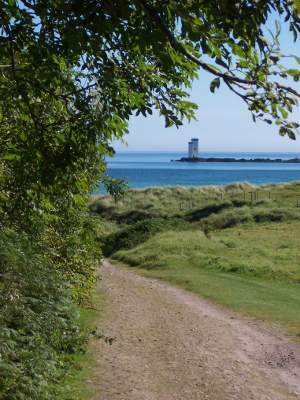 On the way, you will feel the healthier for taking in Islay's fresh sea air. There are, of course, many sites of interest to visit and a range of famous whisky distilleries, too. Taking a bike is an efficient and enjoyable way to visit all three distilleries near Port Ellen; Laphroaig, Lagavulin and Ardbeg are all served by the Three Distilleries cycle and foot path. You can continue beyond to the mediaeval Kildalton Cross or further up the varied coastal road to Claggan Bay. I can advise you on local conditions and other places on Islay to visit. I aim to provide traditional service and good value. I am pleased to have received very positive feedback from many satisfied customers. I look forward to meeting you when you come to holiday on Islay.